JBF Early Birds get the BEST deals and If you are a JBF Consignor, you are soooooo in! Being a Volunteer/Team Member is the key to having the BIGGEST selection BEFORE we open to the public! Plus you make more on your sold items! We also welcome Expecting/New Parents, Military, Teachers and First Responders to join us. Not in one of those groups? Not a problem, you have time to become a consignor and Team Member to shop FIRST! 6:30pm: Family Presale for REGISTERED, presale attendees and Consignor/Team Members with children who can not be worn and attend earlier presales. All children are welcome at this time. Doors close at 8:00pm and registers close at 8:30pm. You may enter any time AFTER your assigned presale time. Consignor and Team Member and their guest passes will be distributed at Drop Off. All other presales require tickets from EventBrite and complete details can be found below. PLEASE NOTE: We are unable to allow children under the age of 12 before Family Shopping time at 6:30pm. The only exception is for children who can be worn on mom or dad. Walking children, stollers and wagons will also be allowed in starting at 6:30pm on Friday and all day on the public days. If you are expecting your first child (or grandchild) or have had your first child (or grandchild) in the last 12 months, you qualify! This includes adoptive and foster parents! Register for your ticket Online (coming soon)! This presale allows you first dibs on the big ticket purchase items you will be needing for your baby! These items sell FAST so the earlier you can shop for them, the better! There is a $5 cost to attend if you register prior to the event through Eventbrite. Your 1 New / Expecting Parent/GrandparentTicket allows entry for you, your significant other AND 2 grandparents so its is a great deal! Space IS limited! NOTE: We are unable to allow children under the age of 12 before Family Shopping time at 6:30pm. 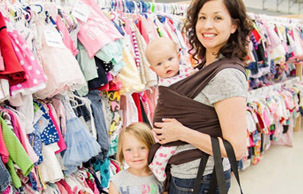 The only exception is for children who can be worn on mom or dad in a carrier. Walking children, stollers and wagons will also be allowed in starting at 6:30pm on Friday and all day on the public days.Tickets for this presale will allow you entry between the hours of 5pm and 8pm. Please plan accordingly. We appreciate all that you do! Whether shopping for the classroom, or your family, come check out JBF! Stock up on books, puzzles, toys and so much more! Register for your tickets online (coming soon)! There is a $3 cost to attend if you preregister through Eventbrite, unless you can grab one of our Early Bird Presale Tickets before they are gone. Your one ticket is good for you AND 1 guest, so grab your BFF and join us! While presale Eventbrite tickets are preferred and CHEAPER, tickets can be purchased at the door for $5 per person, cash only unless tickets sell out online prior to the event. Space IS limited! NOTE: We are unable to allow children under the age of 12 before Family Shopping time at 6:30pm. The only exception is for children who can be worn on mom or dad. Walking children, stollers and wagons will also be allowed in starting at 6:30pm on Friday and all day on the public days. Tickets for this presale will allow you entry between the hours of 6:00pm and 8pm. 1. 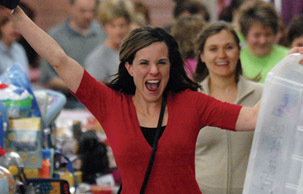 At our JBF Southern New Hampshire events, we love helping area associations and groups by being a fundraising partner! 2. We are looking for organizations who would be able to help us with our set up and/or break down shifts. In exchange we would make a $300 donation to your group. Contact us for details. 3. 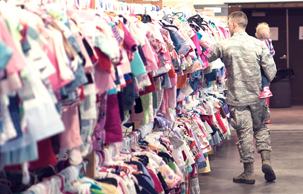 Collect Donated Items & Consign for Your Group to Raise Funds! 1. Sign up and get a consignor number for your group. 2. Select a JBF coordinator for your group. 3. The coordinator can collect and tag sale items for your group like a single consignor would normally, and bring them items to the sale during the drop-off period for the event. At the end of the sale, your group or organization will receive a check for 60% of all items sold, less the $12 consignor fee. If someone from your group joins our team to help out at the sale for 4 to 8 hours, your group can earn 5-10% more! This is an easy way to raise funds for your group and to help everyone clean out their closets in the process. Questions? Contact us so we can put cash into your organization! We have vendor opportunities! We see hundreds of shoppers at our event. If your business or organization is family minded we have opportunities for you to reach our audience. Our vendor opportunities are limited and will fill up quickly. You can find more information about our vendor opportunies & sign up online (coming soon).